Support Center / Troubleshooting / How do I check for updates? NOTE: If it is greyed out, it means that you have the latest available version installed. 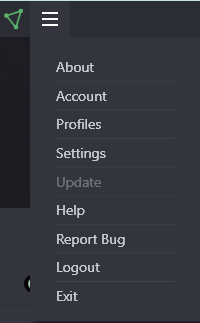 If there are any updates that you can install, it will be clickable , if not, it will stay greyed out. When its open, on left side of your mac top bar you will see ProtonVPN, click on it. You will see “Check for updates” button, click on it. If you have the latest macOS ProtonVPN application version installed, you will get a message window saying so. Go to the Google PlayStore application. Press on the top left 3 horizontal lines to expand the menu. You will be shown with the latest possible updates to the application. You can update ProtonVPN separately or click on update all. How to check that my IP address has been changed? How to change country/server location? OpenVPN have now released its version 2.4.3 – When and how will you update ProtonNPN ? IS ProtonVPN (and its components) a 32 or 64 bit application ?